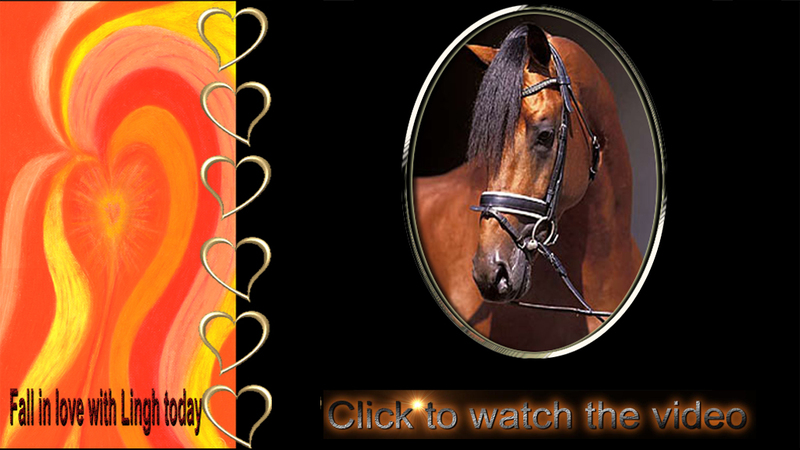 Tribute Art Collages are personalized, large-format works of art that creatively weave and display digital scans of your favorite photos into large new visual works that pay homage to your career, your horses and your memories. Tribute Art Collages make a unique and impressive statement about you. As an added benefit, we bring new life to aging photos through retouching and preservation. Hi, Karin Offield here. Some years ago I found myself in the same quandary many other horse aficionados have — I had a lifetime’s worth of irreplaceable photos that were both wearing with age and too numerous and difficult to display. Then I met Jeffrey Paul Burger, a talented photographer and digital artist who I commissioned to create a 58” x 48” Tribute Art Collage for me that showcased my life’s work and the horses I love. In the process, he digitally retouched many of the images back to their full glory. The finished piece nearly fills a wall. 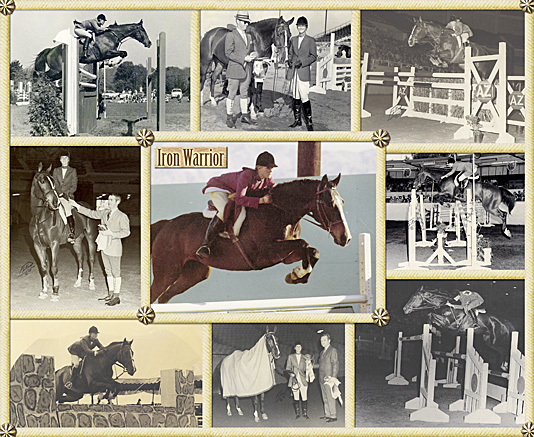 The spiral in this Tribute Art Collage you see below visually tells the chronological tale of my journey from my first show at age 6 to the ride on my first dressage champion, Icon. The background is a photo of leather, and the entire piece is complimented by a beautiful equine quote from William Shakespeare. I was so pleased with the Tribute Art Collage that I asked Jeffrey to print a half-size version, and I presented it as a framed gift to my parents. I also commissioned a smaller tribute to my favorite jumper of all time, Iron Warrior. Looking at representations of these works of art on todays computer screens is nothing compared to the power, presence and beauty of the actual pieces hanging framed on your walls. The wall-sized Tribute Art Collage gives me great pride every time I look at it and is a constant conversation piece with my guests. In fact, many friends with similar challenges have asked how they could commission a personalized tribute piece for themselves. We’ve created a few sample templates to make it easy to select a design that best suits your taste. We will also work directly with you to customize a tribute piece according to your specific desires. To have a no-pressure conversation about the possibility of commissioning your own tribute collage, please contact Karin directly at 231-242-0012 or info@offieldfarms.com. Now in 2014, I have commissioned graphic artist Marty Petersen to accomplish these jobs. Marty is an established professional commercial illustrator and designer based in the Colorado front range. He’s been in the business for over 26 years, 12 of those being focused in digital media. Marty illustrates science fantasy and children’s books, creates logos, event posters, interface designs, splash screens, static images & layered art for animation, digital photo retouching, technical and medical illustration. A very versatile artist, he can illustrate anything from basic line art to full color highly detailed illustrations in many styles; airbrush, watercolor, pen & ink. All of his creations are completely hand painted, digitally. Q: Can my Tribute Art Collage be customized? A: Absolutely. In fact, every piece is custom and the templates are just a point of reference for style and price. In addition to the fact that your photos are intrinsically unique, each photo collection presents logistic challenges that require creative solutions. Marty can work with you to integrate all the elements that you wish, presented in a style that suits your taste. This includes material, number of photos, arrangement, background, title, quote, photo captions, etc..
Q: Can I order additional smaller prints of my Tribute Art Collage to give to friends and relatives? A: Yes, you can easily get additional prints. Pricing varies with size and quantity. Q: How do my photos become part of my Tribute Art Collage? Q: I’m nervous about sending my originals. Can I send digital scans? A: First, we recognize how highly you prize your photos, and we treat them as if they were our own. We’ve never lost or damaged client materials — ever. We also recommend shipping insured by UPS or FedEX for tracking purposes. That said, if you don’t wish to ship them, Marty can work from scans you provide. In that event, we recommend you have a local professional service do it for you to our specifications unless you have good equipment and a reasonable degree of expertise. Please consult us for details. A: We highly recommend that your piece be professionally framed and glazed, both to protect your investment and to complete the already impressive statement your piece will make. (Integrating an engraved plaque is also a nice touch.) While we certainly can provide framing for you, we recommend that you have a local framer handle that for you for two reasons: 1) Shipping a framed piece of this size presents packing/shipping challenges and usually incurs significant additional cost and 2) framing is a personal choice that you may enjoy making according to your décor and personal preferences. Of course, if you want us to handle the framing, glazing and shipping, we offer that service at an additional fee. Q: Can my Tribute Art Collage be printed on canvas or other materials? A: Yes. While our usual treatment is on photographic paper, we can print on a wide variety of materials. Canvas provides more of a fine-art feel and doesn’t need to be glazed or even framed unless the environment really warrants it. We can also print on vinyl at very large sizes — perfect for situations where you want the art to be displayed in a harsher environment like a stable. (You can even hose vinyl prints down!) We even have an affiliation with the exclusive distributor for a special stretchable canvas that allows us to provide you with equine art that is essentially full-wall wallpaper — either repetitive or non-repetitive. Please call for more information. Q: How does pricing and payment work? A: Prices are based on the templates illustrated. We will quote you a final price once we have discussed your specific needs. We accept a 50% deposit when we receive your photos and request the remaining balance upon completion and shipment. Q: Does anything else come with my tribute art? A: We ship you a CD with any high-resolution files of any of your photos that we have scanned. As our gift to you, we also include a DVD slide show of your scanned images suitable for display on any home entertainment DVD player. Q: How do I take the next step? Tribute Art Collages — Styles and Pricing. Since you and your photos are unique, your tribute piece(s) will be unique as well. We endeavor to accommodate minor variations without additional charge. For more ambitious requests, we will provide you with a quote before beginning your commission. We can also provide additional gift prints at a modest fee. For more information, contact Karin at 231-242-0012 or info@offieldfarms.com. Our work load is stacked up right now, but if you contact us now for a job, we can schedule completion in 4-5 months. Thank you for checking out Tribute Art.